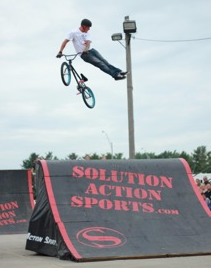 We are EXCITED to welcome back "Solution Action Sports" performing their high-flying BMX and Parkour Stunt Show! Join us as Solution Action Sports performs a high-flying BMXand parkour stunt show. All ages will love this exciting show! For planning purposes, PLEASE let us know you're coming for pizza by signing up HERE by Friday 4/13/2018 at Noon!